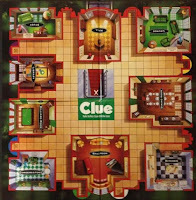 Clue hosted by A Million More Pages on Goodreads. The heavy game finished long ago but we have been very slow in playing the casual game and I also forgot to check in. Zu guessed right and won the game. This was fun though and I know there is a new challenge coming at some point. If I see it I will take part again. Object: Be the first detective to determine which Suspect killed Mr. Boddy, in which Room and using which Weapon. The game will be played between 3-6 people and will end when someone correctly guesses the Suspect, Room and Weapon. 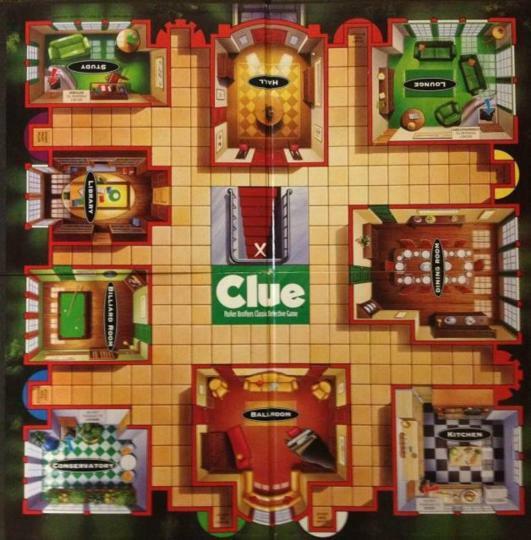 We will use Rooms from the Clue game board and two dice. To play, sign up in the sign up thread, you will be paired with others, and we will create a separate discussion thread for your game. The Mod will determine the murder Suspect, Weapon and Room and will "deal" you your hand by sending you a private message (PM). Once you have finished your turn, you can immediately start another turn. You don't have to wait for the other players to take their turns. When playing the game, please be considerate of the others playing and respond to their messages within one day. Books must be started AFTER your dice roll. Fanatic Reader: no book limit! 1. Roll the dice. You can choose the number on either of your dice or add the two numbers together to choose your move. 12- Secret Passage to Any Room- When using a Secret Passage, choose one of your opponents, visit their home page, click on the "Compare Books" link, and choose one book to read that you both have in common. Each room has a designated book list. Click on the link for that list and choose one book to read. OPTION 2: MATCH the first letter of either your Suspect OR Weapon OR Room with the first letter in your book's title OR the author's first or last name. **This is a change from the ROUND 1 and 2 games. You will only read 1 book per turn, and you have a choice which option to use. You do not have to fulfill both options with your book choice. Make a suggestion to the designated player on your discussion thread (player designation will be assigned by Mod at start of game). You can make your suggestion before you finish your book, but your turn will not be complete until you finish your book and post your book's title, date completed and rating. 4. To Prove Someone True or False: Post either "I can prove you wrong," OR "I cannot prove you wrong," on the discussion thread. If you can prove them wrong (meaning you have one of those cards in your hand), THEN send that player a PM stating which card (choose only one card) you have. 5. If the first person cannot prove you wrong, then make your suggestion to the next designated player on the list and so on until either someone proves you wrong or you've asked all other players. 6. Your turn ends when someone has told you which card they have AND you have read your book. You may then begin another turn by rolling the dice. You can make a final accusation at the start of any new turn. You DO NOT have to be in the room you're guessing. Simply state in your discussion thread that you're making your final accusation and which suspect, weapon and room you are guessing. The Mod will tell you whether you are right or wrong. If you are wrong, you are done playing and the Mod will redistribute your cards to the other players. If you are right, YOU WIN! Mr Green with a Rope in the Conservatory. Professor Plum with a Rope in the Lounge. Mrs. White with a Rope in the Ballroom. Miss Scarlett with a Rope in the Ballroom. Colonel Mustard with a Rope in the Hall. Did not finish the book before the game finished. Professor Plum with a Rope in the Billiard Room. Professor Plum with a Candlestick in the Hall. 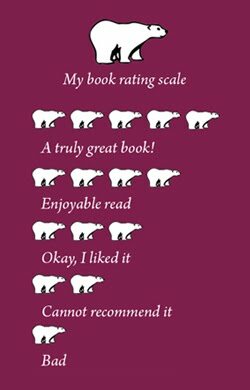 I am not a reviewer, all I do is to let you know whether I liked the books or not. 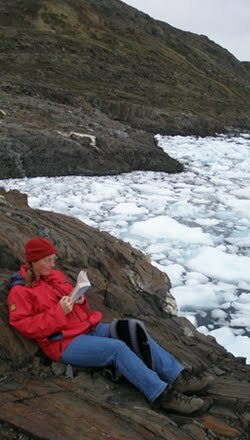 Jane has read 4 books toward her goal of 200 books. CCC - Let's Build a House! CCC - Let's Play Jeopardy! MMP - Hogwarts: Guess Who? MMP - Hogwarts: Who Is ...The Death Eater?